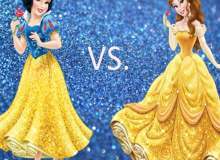 Belle or Snow White - Which Princess Are You? Are you Snow White or Belle? This is a quiz about Snow White and Belle. Who is your favourite? Are you stuck and can't choose? If so, have a go at our quiz to see which Disney princess you are! We hope you enjoy our Disney princess quiz that will help you determine if you are Snow White, or Belle! We didn't include all of the Disney princesses, but if you like this, leave a comment and we could maybe make one with more princesses involved! Which name intrigues you the most? Do you wear lots of makeup? No, makeup makes me puke!! What is your favourite season in the year? Which tastes better to you? Quiz topic: Am I Snow White or Belle?